The following are some of the most common resolutions people make this time of year. 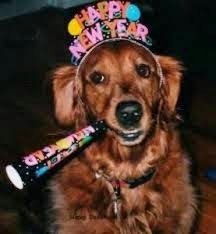 The same resolutions can be good for your pet. Many people do not get enough regular exercise, which can lead to long term health problems. Try to find something you enjoy and make realistic goals to include more physical activity into your life. Regular exercise can keep your pet healthy too. Consider including your pet in your exercise goals. It can be fun and you both could benefit! Evaluate your current eating habits and make goal to improve. It might be to lose weight or just improve the quality of your diet. Evaluate your pet’s current diet. The quality of your pet’s diet is directly related to their health. Pet obesity has been on the rise and leads to many other health problems can be life threatening for your pet. Also, many foods contain allergens that can be causing your pet problems too. Detox your pet’s environment. Your pet is just as susceptible to environmental toxins as you. Beware what products your pet comes in to contact with to protect them. Look at your pet products, but also your cleaning supplies and pesticides used in and around the home. Evaluate your finances and make sure you are spending your dollars wisely. Being proactive with preventive care saves money. Preventive care for your pet will save you money. Providing a healthy, high quality, hypoallergenic diet, and supportive supplements (such as Power Probiotics for Pets and Amazing Omegas) can save you money in the long run by reducing your veterinarian expenses. 5. Spend more time with loved ones and have more FUN! Life gets busy and it is easy to get caught up in the day to day and forget to have fun. Make an effort to schedule quality time with those special to you and take time to enjoy life! It is important for your pet to spend time with the ones they love.. When life get’s busy it is often our furry friends that get neglected. Our pets want and need our attention, neglect can often lead to negative behavior. Make it a goal to have more “fun time” with your pet. Who knows, it might surprise you who has more fun!